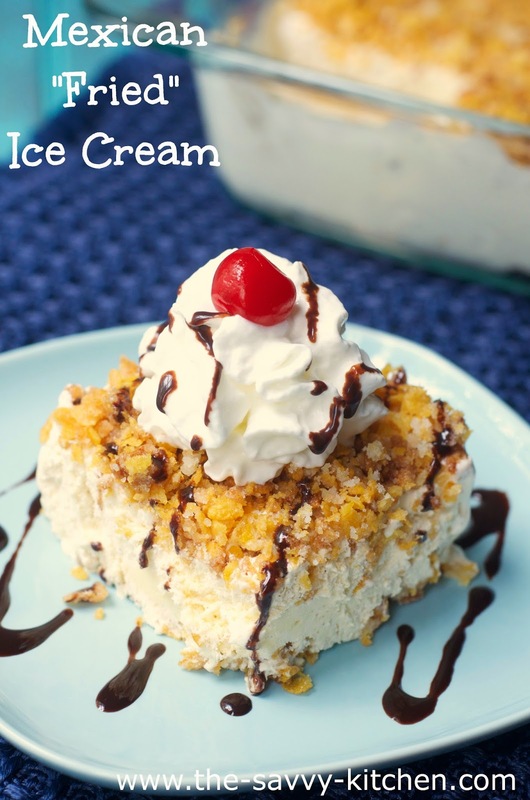 Want fried ice cream without the hassle of setting up the deep fryer, worrying about your ice cream melting and with limited steps? I've got your solution. This month's Secret Recipe Club assignment was Sara's blog, Cook with Sara. She has so many incredibly delicious looking recipes on her blog, so I can't wait to go back and try out some more! This time I chose to make a dessert (obviously) since summer is coming to a close and I need to squeeze in all the ice cream I can before apple cider and hot chocolate take over! 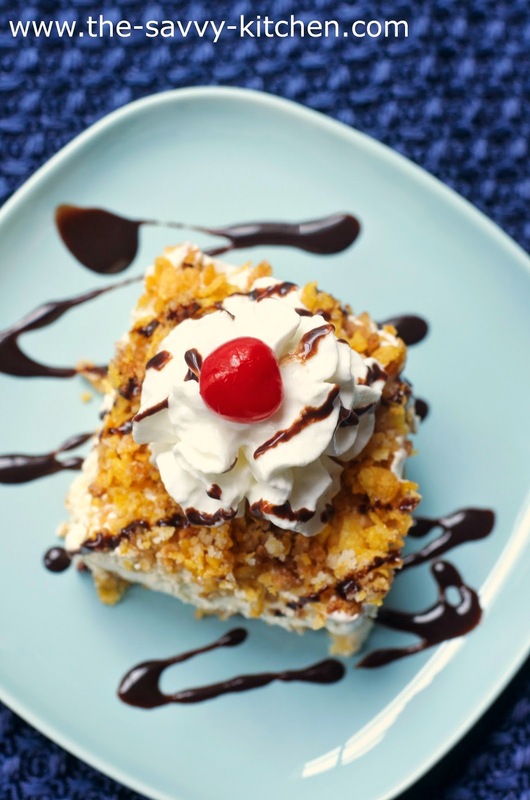 I love ordering fried ice cream when we go to our favorite local Mexican restaurant, so I couldn't wait to make this non-fried "fried" version at home. I decided to leave out the honey since I wanted Bradley to enjoy some and he can't have any until he's one (which is THIS Friday...Oh. My. Goodness.). I love the dash of cinnamon that is mixed in with the ice cream and whipped topping. It gives the dessert that "Mexican ice cream" feel. 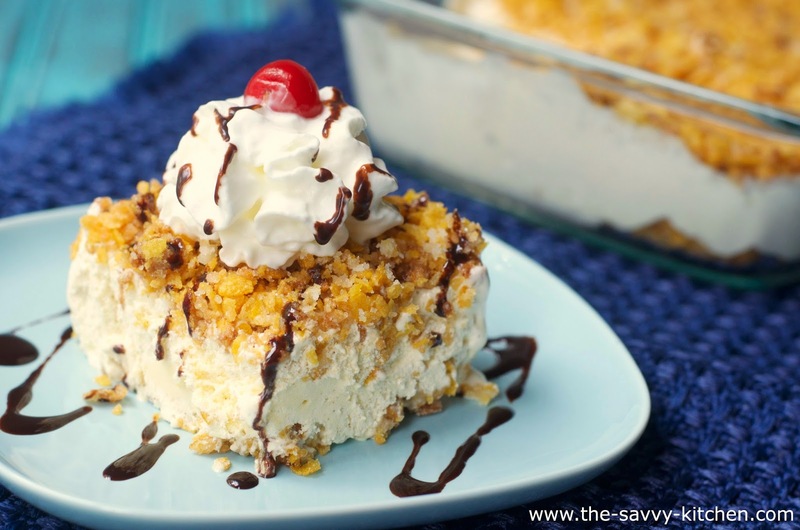 The topping adds the crunch that typical fried ice cream usually has, but you save so many calories (and your sanity!) by not actually having to fry this. It's so so good. Enjoy! Soften the vanilla ice cream and the cool whip by thawing on the counter for 20-30 minutes or so. Meanwhile, over medium heat, melt butter in a large skillet. Add the crushed corn flakes and sugar and stir to combine. Fry mixture for 5 minutes, stirring constantly, until cereal is golden-brown. Spread 1/3 of the corn flakes mixture into the bottom of a 9x13 baking dish. Set aside. In a large bowl, stir together the softened ice cream and whipped topping. Sprinkle with cinnamon. Using a spatula, stir a then mix well to combine. Spread ice cream mixture over the top of the corn flake mixture in the bottom of the pan. Spread the remaining corn flake mixture evenly over the ice cream. Drizzle honey over the top. Cover and place in freezer. Freeze for at least 5 hours, or overnight. Cut into squares and serve with drizzles of chocolate syrup and caramel sauce, additional whipped topping and cherries. Makes 20 servings. Note: You can also half the recipe and make it in an 8x8" or 9x9" pan. You should totally make it for them!! What?!?! Fried ice cream that you don't fry? It looks wonderful! Can't wait to try it. This looks ahmazing! I get something like it at my favorite Mexican restaurant called cajeta, it is a huge ball of homemade vanilla bean ice cream rolled in toasted pecans, toasted coconut, and drizzled w/ chocolate and caramel :) Soooooo good. Oh my gosh - I LOVE this dessert and have not had it in such a long time! GREAT SRC pick! oh my goodness - we had each others' blogs for this month's reveal. Too funny! I loved the soup I made from your blog too! So clever to use crushed corn flakes as the "fried" part - this looks so heavenly. Oh, My! Yes Please. I love the 'fried' ice cream. So much easier. And now I don't have to wait to visit the local TexMex place.